I'm having a hard to time to figure this out using the resources here, so, if I overlook something, bear with me. I need to copy the whole web site back to my PC, with exclusion of couple folders that are 'sessions' on a database. If I try to sync everything, include that /sessions folder, sometimes I get error when a user leaves the database, so I figure out that the best option will be to EXCLUDE that. This work on the sense that /sessions IS NOT being copied, but also, any sub-folder from my root. What I'm doing wrong? /public_html -delete -preservetime -filemask=""| sessions/""
and any file from the root was downloaded too. The results vary, but any gives me ALL files from root, All folder, All sub-folders, All files from sub-folders BUT not /sessions. No, I do not unfortunately. The code I sent should work. You can use the GUI to build a filemask and that's what I did for you in my example. I'm not sure why it's still syncing the sessions folder. Also, "*/" means to not sync any subfolders so you don't want that. Where did you find this 'File Mask Edit'??? "too many parameters for command 'synchroniza'." if I use the "sync' from the program, and not from my script, IT WORKS!!!!!!!!!!!!!!! so, what could be wrong??? I'm not sure. I don't use the txt file method so I have no experience with it. I will say I don't think you need the *. * part of the filemask. I just leave it blank on mine and I have just the exclusions set. I sync tons of folders and subfolders and have no issues. I'll look through the forums. There should be an example of what you need somewhere. You were right again. 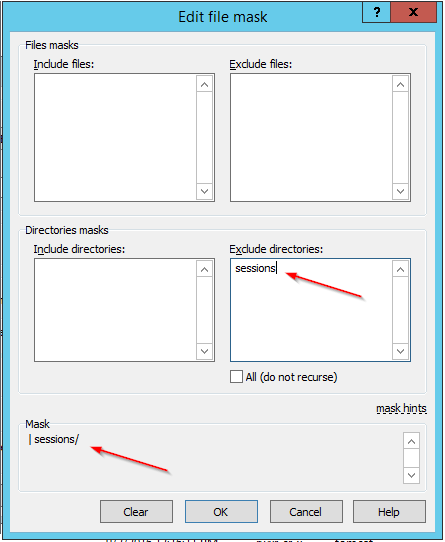 If I just place the exclusion, on the GUI version (| sessions/ ), works exactly the way I need. synchronize local c:\MySites\Site1\ /public_html -delete -preservetime -filemask=""| sessions/""
Give me the Too Many Parameters err. synchronize local c:\MySites\Site1\ /public_html -delete -preservetime -filemask="| sessions/"
ONLY ONE quotation mark on each side. All info on the forum always mention that you have to have two cotations! THank you for pointing the Mask File Editor. That was a key for me to find the right way. Only, if you provide commands on command line (as opposite to a script file). OK. I was to fast. I was doing tests in a demo base, since the real one is about 1.2Gb large. is that if the '/sessions' is empty, they will not transfer. if it's not, then it will try to read files and transfer it, even do it's marked as not to. end then the error happens. I found it after about 4 hours downloading the site. PS: if I use the GUI version, it works. Only on the Script it's not. All files and folders are copied to my PC, but the files and folders under /sessions. synchronize local c:\MySites\Site1\ /public_html -delete -preservetime -filemask="*; */ | sessions/"
Here is an example of my code inside the .bat file which works without issue. One caveat, if you copy this code, you must remove any blank spaces AFTER the ^ symbol. The ^ must be the final character on each line. Using a different format does not change a meaning of the commands.